February is here and Valentine’s Day is simply around the corner. Love is a beautiful adventure, and it deserves to be celebrated. While love is already in the air for some people, you may find it exhausting to find the perfect gift for your significant other. Although a small gesture is enough to express your eternal love, why not you go for a luxury present this year to convey your feelings? This Valentine’s day, commemorate the season of love with The Luxury Hut and honour your loved one with a gift that she/he will truly cherish for a lifetime – a Rolex watch! To make the process simple, here we have assembled five beautiful Rolex watches that would make the perfect gifts for your beloved Valentine! Ideally, Rolex Datejust watches are the brand’s most popular and versatile collection that comes with a plethora of dial materials, sizes, metals and colour combinations. 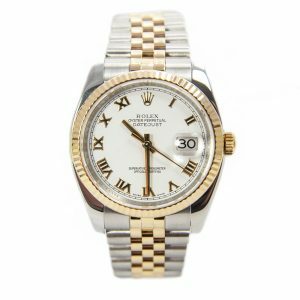 The Rolex Datejust 116233 flaunts the hallmarks of a classic Rolex watch with steel and yellow gold two-tone case and bracelet, yellow gold bezel along with gold Roman numerals and hands on an original Rolex white dial. Learn more about the Rolex Datejust 116233. However, white gold and diamonds are indeed a good choice for a ladies’ Rolex. This 28mm Rolex Ladies Datejust 279174 integrates the strength of stainless steel and sparkle of diamonds to be an exquisite and functional watch. The watch features the white gold serrated bezel that contrasts well with the original Rolex Dark Grey diamond dial and on the matching Jubilee bracelet. Does your partner lean towards a more sporty style? If yes, then you cannot certainly go wrong with a bi-metal Rolex Submariner. 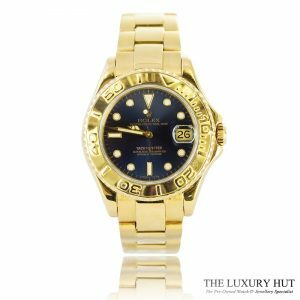 Rolex is well-known for its famous signature sports models, and the Submariner is the quintessential divers’ watch that possesses a history stretching back to 1950s. 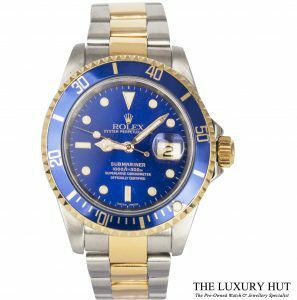 With 40mm steel case, gold & blue bezel on matching steel and gold oyster bracelet, and original blue Rolex dial, this Submariner Ref 16613 bears an outstanding masculine appeal that will never let you look out of place. Learn more the Rolex Submariner 16613. Originally manufactured for aeroplane pilots, Rolex GMT-Master is one of the most coveted watches in the world. 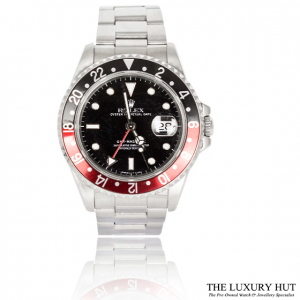 And, one of the most sought-after models of all time is the Rolex GMT-Master II 16710 with two-tone ceramic bezel in black and red. Nicknamed as ‘COKE’, this watch features black stick dial with the larger luminous display, bi-directional rotating bezel in stainless steel, and Oyster bracelet. This 40mm steel case watch is also characterised by applied hour markers and a colourful GMT hand on the dial to match the red insert on the bezel. Learn more about the Rolex GMT-Master II 16710. It would ideally take a long time to find a watch more elegant and classic than the mid-size Rolex Yacht-Master R68628 in 18ct yellow gold. With a classic blue dial topped with luminescent hands, the watch creates a statement look that will mesmerise everyone in the room. 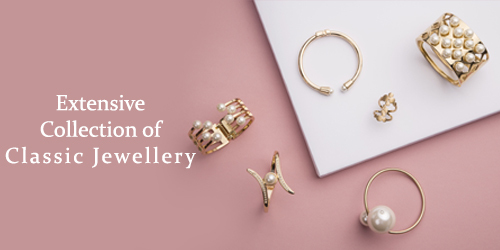 The yellow gold Oyster bracelet secured by Fold clasp is exquisitely accented with a yellow gold rotating bezel. Besides offering a stylish look, the Yacht-Master R68628 boasts a scratch-resistant sapphire crystal, Quick-set movement and a 35mm stainless steel Oyster case that will flatter the wrists of both men and women. The watch comes with Original Wooden Rolex Box, Rolex warranty papers and more. Learn more about the Rolex Yacht-Master R68628. So, we ensure this Valentine’s Day will be the one that you and your significant other will cherish forever. 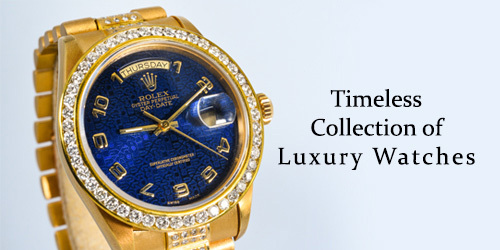 Just make your Valentine’s dreams come true with a classic yet luxurious Rolex watch from The Luxury Hut. If you are still looking for the perfect gift for your lover, explore our extensive collection of Rolex watches that may serve as a unique token of your relentless love. Hurry up! Get your shopping done soon so that you can relish each other’s company utmost on that special day.